Hostas, also called Plantain Lilies, are a home landscape mainstay. They are perennial, reappearing dependably every spring to serve as groundcovers and foliage plants for shady areas and around trees and shrubs. They are versatile, low-maintenance plants. The many attractive varieties of hosta have flowers as well. Although not as ornamental as the foliage, the flowers add a pretty touch of color for a short time in summer to brighten shaded spots. Once established in a comfortable site, hostas thrive for many years with minimal attention. Size: Various types of hostas grow in mounded leafy clumps from about 1/2 to 1 1/2 feet tall. Their flower stalks typically extend to 2 1/2 feet. Undivided, healthy, mature plants can spread as wide as 5 feet, but many homeowners divide their hosta clumps periodically to maintain them at 18 to 24 inches wide. The smaller hostas, Hosta venusta and its hybrids, are miniatures that grow anywhere from 4 to 12 inches tall. Foliage: Hostas are valued for their dramatic foliage. Leaves of juvenile plants often do not show the shape and texture that they will have as adults. Different varieties offer leaves that range from pale green to medium green to yellow-green and even blue. Some are variegated, having striking yellow or white edges. Leaves are typically highly textured, often featuring prominent ribs or veins. They may also have shiny or waxy surfaces. 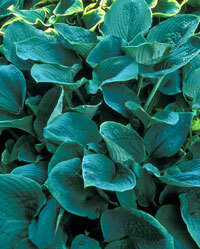 Individual leaves of the various hostas may measure from 3 to 15 inches long and from 1 1/2 to 6 inches wide. The smallest may have an area of two square inches, while the largest leaves may be over 1 square foot in area. Some are more sword-shaped, while others are elliptical or spoon shaped. Hosta foliage turns yellow, then mushy, then dies back to the soil when frost arrives. Flowers: Hosta flowers bloom in mid to late summer or early fall, depending on the variety. They appear along stems that arch above the clump of leaves. They are funnel-shaped, typically about 2 inches long and usually lavender. However, the plantain lily’s flowers are white and a spectacular 4 to 5 inches long with a lovely fragrance. When they fade, green seed pods appear in their place on the stalks. The stalks should be cut off at this time.